When a clinical laboratory reports a test result as a variant of uncertain significance, it may offer follow-up testing of family members to help classify the variant in the family. This service is often, but not always, offered free of charge. Because classification might require testing many relatives, sometimes patients do not have pedigrees large enough to qualify for variant classification at first. The previous pages explain how you can grow your pedigree to make it more likely that you will be able to classify your variant. Several clinical laboratories offer clinical genetic testing panels and are involved in different types of variant classification activities. Individual laboratory policies regarding family studies vary between laboratories. Not all individuals will qualify for variant classification at all laboratories. We recommend that you contact the laboratory where your testing was done to determine if you qualify for variant classification activities. 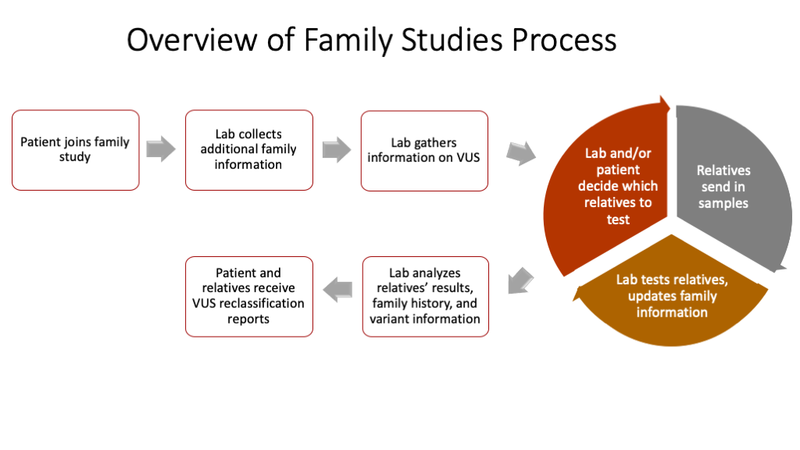 While the exact family studies process for each lab may vary, it will generally follow the steps shown below. The University of Washington is offering a clinical, patient-driven Family Variant Classification Test for individuals who do not qualify for family studies at their original testing laboratory. The Family Variant Classification test must be ordered through a health care provider after confirmatory variant testing has been completed. Family testing is provided as follow-up to patients who received a VUS from the University of Washington BROCA or ColoSeqTM genetic testing panels at no additional charge. This table is for informational purposes and is not an endorsement of individual laboratories. If there are errors or omissions, please contact us. There may be research studies that are interested in families that have variants in specific genes, or that are interested in variants of uncertain significance in general. Genotyping as part of a research study is almost always offered as a free service. There may be surveys or other aspects of a research study that you are asked to participate in as part of the research variant classification process. Research studies are voluntary. Inclusion criteria are study-specific. You may not qualify for any or all research studies. The FindMyVariant research study at the University of Washington ended in summer 2018.